For the lime jalapeño cream: In a blender, combine yogurt, lime juice, lime zest, cilantro, jalapeño and garlic. Pulse until fully combined. Transfer to a small bowl and chill for at least one hour before serving. 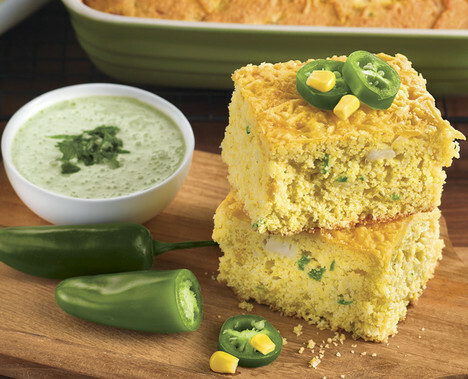 For the jalapeño corn bread: Preheat oven to 400˚. Coat a 8x8-inch baking pan with cooking spray. In a small bowl, whisk together eggs, milk and avocado until combined. Empty corn muffin mix into a large bowl. Add avocado mixture, stir until just combined and some lumps are still visible. Fold in jalapeño, onion, ¼ cup cheddar cheese, corn and garlic. Allow batter to sit for 6 minutes before pouring into prepared 8x8-inch baking dish. Bake for 20 minutes or until center of corn bread is solid. Top with remaining ¼ cup cheddar cheese and cook for an additional 5 minutes or until cheese is melted. Allow to cool for 10 minutes before serving. Top each piece with a dollop of lime jalapeño cream.